For this specification to exit the CR stage, the conditions detailed in the CR Exit Criteria (Public Permissive version 3) document will have to be met. This document was published by the HTML Working Group as a Candidate Recommendation. This document is intended to become a W3C Recommendation. W3C publishes a Candidate Recommendation to indicate that the document is believed to be stable and to encourage implementation by the developer community. This Candidate Recommendation is expected to advance to Proposed Recommendation no earlier than 17 June 2013. All feedback is welcome. Each CanvasDrawingStyles object has a dash list, which is either empty or consists of an even number of positive non-zero numbers. Initially, the dash list must be empty. If any value in the array is not finite (e.g. an Infinity or a NaN value), or if any value is negative (less than zero), then abort these steps (without throwing an exception; user agents could show a message on a developer console, though, as that would be helpful for debugging). Negative values for radius must cause the implementation to throw an IndexSizeError exception. 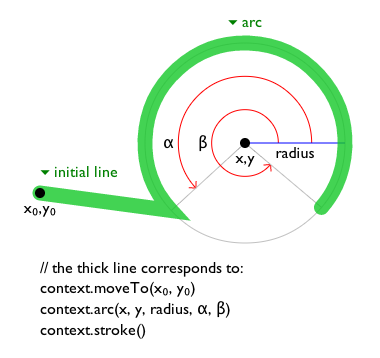 Otherwise, let The Arc be the shortest arc given by circumference of the ellipse that has radius radiusX on the major axis and radius radiusY on the minor axis, and whose semi-major axis is rotated rotation radians clockwise from the positive x-axis, and that has one point tangent to the half-infinite line that crosses the point (x0, y0) and ends at the point (x1, y1), and that has a different point tangent to the half-infinite line that ends at the point (x1, y1), and that has a different point tangent to the half-infinite line that ends at the point (x1, y1) and crosses the point (x2, y2). The points at which this ellipse touches these two lines are called the start and end tangent points respectively. The method must connect the point (x0, y0) to the start tangent point by a straight line, adding the start tangent point to the subpath, and then must connect the start tangent point to the end tangent point by The Arc, adding the end tangent point to the subpath. If either of the radii are negative, throws an IndexSizeError exception. The addColorStop(offset, color) method on the CanvasGradient interface adds a new stop to a gradient. If the offset is less than 0 or greater than 1 then an IndexSizeError exception must be thrown. If the color cannot be parsed as a CSS <color> value, then a SyntaxError exception must be thrown. Otherwise, the gradient must have a new stop placed, at offset offset relative to the whole gradient, and with the color obtained by parsing color as a CSS <color> value. If multiple stops are added at the same offset on a gradient, they must be placed in the order added, with the first one closest to the start of the gradient, and each subsequent one infinitesimally further along towards the end point (in effect causing all but the first and last stop added at each point to be ignored). The createLinearGradient(x0, y0, x1, y1) method takes four arguments that represent the start point (x0, y0) and end point (x1, y1) of the gradient. The method must return a linear CanvasGradient initialized with the specified line. The createRadialGradient(x0, y0, r0, x1, y1, r1) method takes six arguments, the first three representing the start circle with origin (x0, y0) and radius r0, and the last three representing the end circle with origin (x1, y1) and radius r1. The values are in coordinate space units. If either of r0 or r1 are negative, an IndexSizeError exception must be thrown. Otherwise, the method must return a radial CanvasGradient initialized with the two specified circles. To create objects of this type, the createPattern(image, repetition) method is used. The first argument gives the image to use as the pattern (either an HTMLImageElement, HTMLCanvasElement, or HTMLVideoElement object). Modifying this image after calling the createPattern() method must not affect the pattern. The second argument must be a string with one of the following values: repeat, repeat-x, repeat-y, no-repeat. If the second argument is empty, the value repeat must be assumed. If an unrecognized value is given, then the user agent must throw a SyntaxError exception. User agents must recognize the four values described above exactly (e.g. they must not do case folding). Except as specified below, the method must return a CanvasPattern object suitably initialized. Patterns must be painted so that the top left of the first image is anchored at the origin of the coordinate space, and images are then repeated horizontally to the left and right, if the repeat-x string was specified, or vertically up and down, if the repeat-y string was specified, or in all four directions all over the canvas, if the repeat string was specified, to create the repeated pattern that is used for rendering. The images are not scaled by this process; one CSS pixel of the image must be painted on one coordinate space unit in generating the repeated pattern. When rendered, however, patterns must actually be painted only where the stroking or filling effect requires that they be drawn, and the repeated pattern must be affected by the current transformation matrix. Pixels not covered by the repeating pattern (if the repeat string was not specified) must be transparent black. Otherwise, the path has a single subpath consisting of four points, with coordinates (x, y), (x+w, y), (x+w, y+h), and (x, y+h), connected to each other in that order by straight lines. Scrolls the current default path into view. This is especially useful on devices with small screens, where the whole canvas might not be visible at once. Further constrains the clipping region to the current default path. Returns true if the given point is in the current default path or the given path. The isPointInPath() method must return true if the point given by the x and y coordinates passed to the method, when treated as coordinates in the canvas coordinate space unaffected by the current transformation, is inside the intended path as determined by the non-zero winding number rule; and must return false otherwise. Points on the path itself must be considered to be inside the path. If either of the arguments is infinite or NaN, then the method must return false. The arguments object's control member is not null and is not an element that is a descendant of this canvas element. If the hitregion is interactive or requires the use of WAI-ARIA states or properties (in addition to role or label), authors must not use an unbacked region description (as there is no method to attach WAI-ARIA states or properties to an unbacked region description and unbacked region are unable to receive focus and therefore cannot be in a focused state). In cases where the region is functioning as an interactive control it must have a control. It is recommended that the control() references an html interactive element unless html does not provide the desired features. In which case WAI-ARIA role, states and properties may be used as allowed in html. Throws an IndexSizeError exception if the either of the width or height arguments are zero. 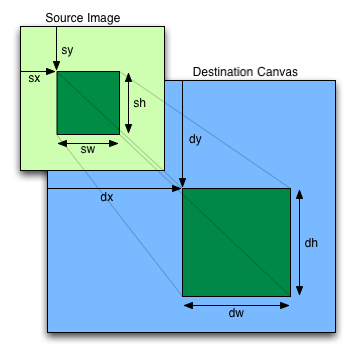 The getImageData(sx, sy, sw, sh) method must, if the canvas element's origin-clean flag is set to false, throw a SecurityError exception; otherwise, it must return an ImageData object representing the underlying pixel data for the area of the canvas denoted by the rectangle whose corners are the four points (sx, sy), (sx+sw, sy), (sx+sw, sy+sh), (sx, sy+sh), in canvas coordinate space units. Pixels outside the canvas must be returned as transparent black. Pixels must be returned as non-premultiplied alpha values. If any of the arguments to createImageData() or getImageData() are infinite or NaN, the method must instead throw a NotSupportedError exception. If either the sw or sh arguments are zero, the method must instead throw an IndexSizeError exception. If any of the arguments to the method are infinite or NaN, the method must throw a NotSupportedError exception. This implies that the data returned by getImageData() is at the resolution of the canvas backing store. This is likely to not be one device pixel to each CSS pixel if the display used is a high resolution display. (Non-normative) Document Object Model (DOM) Level 2 HTML Specification , J. Stenback, P. Le Hegaret, A. Le Hors. W3C. Document Object Model (DOM) Level 3 Events Specification , T. Leithead. W3C. HTTP State Management Mechanism , D. Kristol, L. Montulli. IETF.